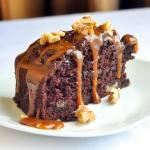 Chocolate Banana Caramel Walnut Coffee Cake - a decadent brunch idea! Chocolate Banana Caramel Walnut Coffee Cake. Perhaps the best ever way to use those over ripe bananas you can never seem to get rid of. Turn them into this indulgent brunch or dessert cake. Chocolate Banana Caramel Walnut Coffee Cake. Some leftover caramel sauce and some speckled ripe bananas on the counter top were the inspiration for this moist, delicious and completely decadent coffee cake. I swirled a little of the caramel sauce along with toasted walnuts through the batter for the cake. Then, I used both as a topping/garnish for the finished product. The result was this spectacularly moist and wonderfully balanced coffee cake that really is an equal marriage of all its tasty components. This is the kind of recipe I consider ideal for a relaxed Sunday bake. It goes equally well with a mid morning brunch as it does for dessert at Sunday dinner. 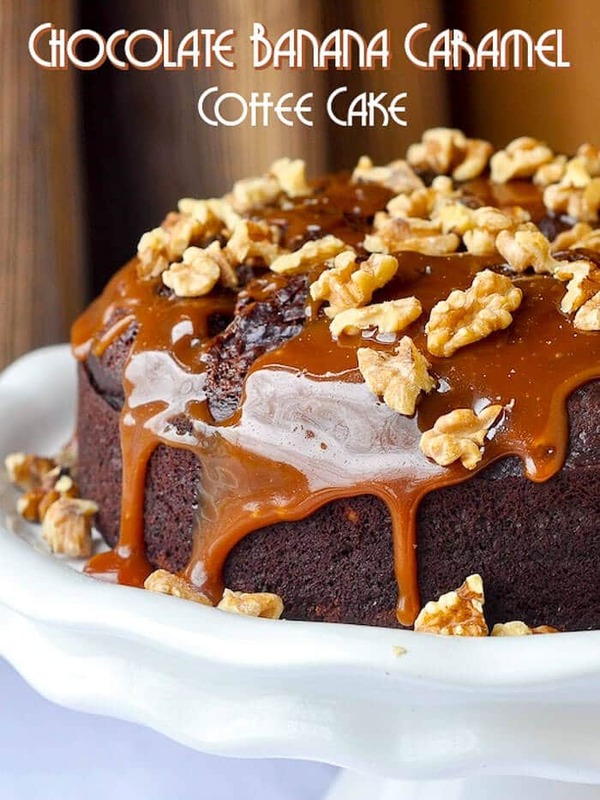 Like this Chocolate Banana Caramel Walnut Coffee Cake recipe? Find many more indulgent cake ideas in our Cakes and Pies Category and dozens of other weekend morning ideas in our Brunch Category. Love chocolate desserts? 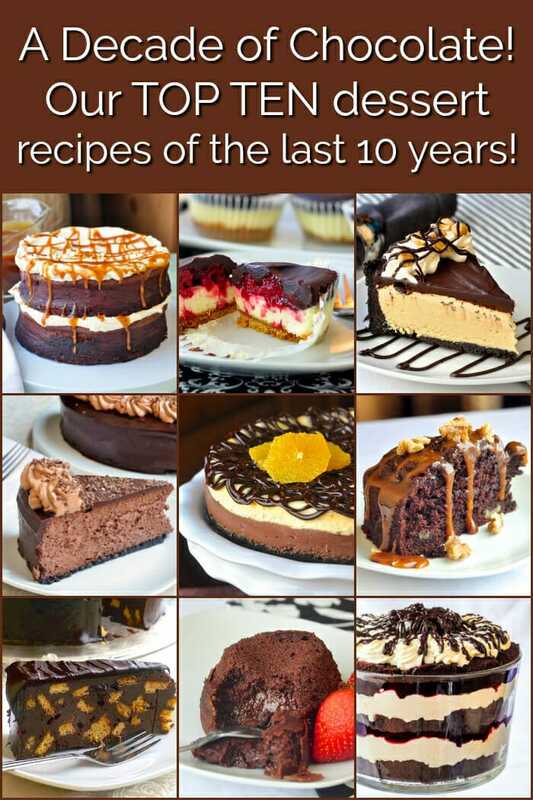 Be sure to browse this incredible collection of Favourite Chocolate Recipes from the past 10 years on Rock Recipes. Chocolate Banana Caramel Walnut Coffee Cake - perhaps the best ever way too use those over ripe bananas you can never seem to get rid of. Turn them into this indulgent brunch or dessert cake. Begin by mixing the sugar and water in a large saucepan. NOTE: I use a large saucepan of about 3-4 quarts or larger because the sugar foams up when you add the butter and cream so make sure you have a large enough pot. Boil the sugar and water over medium heat until the mixture begins to turn a light amber color. It is very easy to burn this mixture which can happen very quickly once the proper color is achieved, so have your butter and cream at the ready, as timing is crucial for this recipe. When the color is right, quickly add the butter and stir quickly until the butter is melted. Remove from the heat immediately and pour in the whipping cream, stirring constantly until the sauce is uniformly smooth. Preheat oven to 325 degrees F. Grease a 9 inch springform pan and line the bottom with parchment paper. Beat sugar and oil in a bowl until foamy. Add eggs and mashed banana. Mix well. Sift together dry ingredients and fold into banana mixture alternately with milk. Fold in walnuts. Pour batter into a greased 9 inch spring form pan. Drop rounded teaspoonfuls of the caramel sauce over the batter (about 1/2 cup) swirl through the cake with the handle of a wooden spoon. Bake for 45 minutes to an hour until a toothpick inserted in the center which comes out clean; this is the best indicator that the cake is fully baked. Ce gâteau et fabuleux sont aspect intérieur me fait saliver! A piece of that chocolaty goodness would be great just about now with a glass of milk….yum! Just made this – well, without the walnuts (don’t like nuts) and I added chocolate chips (love chocolate). It is moist, delicious and absolutely divine… what would I do without your recipes!!! Where is the coffee in the ingredients list and recipe? I’m happy to make without as it looks and sounds delicious without it but you keep referring to it being a coffee cake. I’m wondering if you can make this cake without adding the caramel sauce to it. Is there a reason you think that’s not possible? Perhaps I’m not understanding the question. I made a vegan version of this cake for a family function. It was delicious! I substitued 1/2 cup of applesauce + 1/4 tsp baking powder for the eggs and used almond milk. (I had to omit the carmel sauce since I couldn’t use butter.) Best recipe for over ripened bananas, ever! This looks fantastic – like all your recipes! I’m just about to make it. I don’t suppose you know roughly how much in cups or grams 3 medium bananas is? Everything else is very specific and bananas are so varied! Please tell me what size pan is used to bake the cake. Thanks. Recipe is updated with the info.